s/n Ciudad Universitaria, México D. F.
California Academy of Sciences (CAS), Department of Entomology, Schlinger Foundation Postdoctoral Fellow, Supervisor: Dr. Charles Griswold (2007-2009). The George Washington University (GWU), Department of Biological Sciences, Ph. D. Advisor: Dr. Gustavo Hormiga (2000-2007). Universidad Nacional Autónoma de México (UNAM), Instituto de Biología (IBUNAM), Bachelor's thesis. Advisor: Dra. Tíla María Pérez Ortíz (1996-1999). UNAM, Facultad de Estudios Superiores Iztacala, Major in Biology (1994-1997). I am interested in the systematics, taxonomy and evolution of the spider Family Tetragnathidae. Also I am interested in conducting biodiversity inventories in tropical ecosystems with Araneomorphae spiders. - Diversidad de las arañas araneomorfas (Arachnida, Araneae, Araneomorphae) en tres encinares de La Faja Volcánica Transmexicana. Programa de Apoyo a Proyectos de Investigación e Innovación Tecnológica (PAPIIT). Clave: IN213612. (2012 - present). - The spider family Tetragnathidae in Australia and New Zealand (Araneae, Araneoidea). 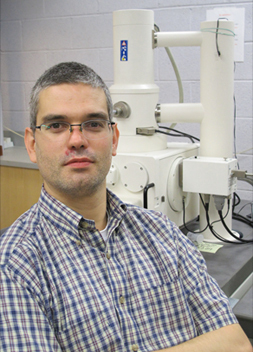 In collaboration with Dr. Gustavo Hormiga (2012 - present). - The spider family Tetragnathidae in Madagascar (Araneae, Araneoidea). In collaboration with: Terrestrial Arthropod Inventory of Madagascar (Brian Fisher and Charles Griswold CAS), Dr. Gustavo Hormiga and Dr. Dimitar Dimitrov (2011 - present). - The Oonopid Spider Planetary Biodiversity Inventory, National Science Foundation [DEB-0072713]. Principal Investigator: Dr. Norman I. Platnick. American Museum of Natural History (2009 - present). - Catálogo de arañas de la Superfamilia Araneoidea en México CONABIO IE002. Principal Investigator: Dra. Irma Gisela Nieto Castañeda. Facultad de Estudios Superiores Zaragoza (2009 - 2011). - Systematics and Monography of Araneoid Spiders [DEB 0328644] Principal Investigators: Gustavo Hormiga y Gonzalo Giribet (2004 - 2007). Álvarez-Padilla F, Ubick D. and Griswold E. C. 2012. Noideattella and Tolegnaro, two new genera of goblin spiders from Madagascar, with comments on the gamasomorphoid and silhouettelloid oonopids (Araneae, Oonopidae). American Museum of Novitates. 3745 1-76. Platnick NI; Abrahim N, Alvarez-Padilla F, Andriamalala D, Baehr B, Baert L, Bonaldo, AB; Brescovit AD, Chousou-Polydouri N, Dupérré N; Eichenberger B; Fannes W; Gaublomme E; Gillespie RG., Grismado CJ; Griswold CE. ; Harvey MS.; Henrard, A, Hormiga G, Izquierdo MA, Jocqué R; Kranz-Baltensperger Y, Kropf C, Ott R, Ramírez MJ, Raven RJ; Rheims CA, Ruiz GRS, Santos AJ, Saucedo A, Sierwald P, Szűts T; Ubick D, Wang, X-P. 2012. Tarsal organ morphology and the phylogeny of goblin spiders (Araneae, Oonopidae), with notes on basal genera. American Museum Novitates. 3736: 1-52. Dimitar D. Lopardo L. Giribet G. Arnedo MA. Álvarez-Padilla F. Hormiga G. 2012. Tangled in a sparse spider web: single origin of orb weavers and their spinning work unravelled by denser taxonomic sampling. Proceedings of the Royal Society Series B Biological Sciences. 279 (1732): 1341-1350. Álvarez-Padilla, F. and G. Hormiga. 2011. Case 3541- Metinae Simon, 1894 (Arachnida, Araneae, Tetragnathidae): proposed emendation of the current spelling to Metainae to remove homonymy with Metidae Boeck, 1872 (Crustacea, Copepoda). Bulletin of Zoological Nomenclature. 68(4) 262-266. Álvarez-Padilla F. and Benjamín S. 2011. Phylogenetic placement and redescription of the spider genus Atelidea Simon, 1895 (Araneae, Tetragnathidae). Zootaxa. 2761: 51-63. Álvarez-Padilla F. and Hormiga G. 2011. Morphological and Phylogenetic Atlas of the orbweaving spider family Tetragnathidae (Araneae: Araneoidea). Zoological Journal of the Linnean Society. 162: 713 – 879. Dimitrov D., Álvarez-Padilla F., Hormiga G. 2010. On the phylogenetic placement of the spider genus Atimiosa Simon, 1895 (Tetragnathidae, Araneae) and the circumscription of the genus Dolichognatha O.P.- Cambridge, 1869. American Museum Novitates. American Museum Novitates 3683:1-19. Álvarez-Padilla F., Dimitrov D., Giribet G., and Hormiga G. In 2009. Phylogenetic relationships of the spider family Tetragnathidae (Araneae, Araneoidea) based on morphological and DNA sequence data. Cladistics. 25: 109-146. Spagna J. C. and Álvarez-Padilla F. 2008. Finding an upper limit for gap costs in direct optimization parsimony. Cladistics. 25: 787-801. Dimitrov D., Álvarez-Padilla F., and Hormiga G. 2008. Until dirt do us apart: on the unremarkable palp morphology of the spider Sternospina concretipalpis Schmidt & Krause, 1993, with comments on the genus Prionolaema Simon, 1894 (Araneae, Tetragnathidae). Zootaxa, 1698: 49-56. Álvarez-Padilla, F. and Hormiga G. 2007. A protocol for digesting internal soft tissues and mounting spiders for scanning electron microscopy. Journal of Arachnology 35: 538-542. Dimitrov D., Álvarez-Padilla F., and Hormiga, G. 2007. The female genitalic morphology of the orb weaving spider genus Agriognatha (Araneae, Tetragnathidae). Journal of Morphology 268(9): 758-770. Álvarez-Padilla, F. 2007. Systematics of the spider genus Metabus O. P.-Cambridge, 1899 (Araneoidea: Tetragnathidae) with additions to the tetragnathid fauna of Chile and comments on the phylogeny of Tetragnathidae. Zoological Journal of the Linnean Society 151: 285-335. Hormiga, G., Álvarez-Padilla F., and Benjamín S.P. 2007. First records of extant Hispaniolan spiders of the families Mysmenidae, Symphytognathidae and Ochyroceratidae (Araneae), including a new species of Ochyrocera. American Museum Novitates 3577: 1-21. Kuntner, M. and Álvarez-Padilla, F. 2006a. Systematics of the Afro-Macaronesian spider genus Sancus (Araneae, Tetragnathidae). Journal of Arachnology 34(1):113-125. - Consejo Nacional de Ciencia y Tecnologíia (CONACYT), Sistema Nacional de Investigadores (SNI) (2011 - present). - UNAM Programa de Apoyo a la Incorporación del Personal Académico de Tiempo Completo (PAIPA) (2009 - present). - Doctoral fellowship, funded by PEET: Systematics and Monography of Araneoid Spiders [DEB 0328644] (2004- 2007). - Doctoral scholarship from CONACYT (2000-2004). - American Museum of Natural History Collection Study Grants (2003). - Marie Stopes Student Travel Award, XXIII Willi Hennig Society Meeting, Paris, France (2004). - Mortenson and Bunting Awards of the Columbian College of Arts and Sciences, George Washington University (2004). Bachelor's Thesis: Francisco Andrés Rivera Quiroz, Uriel Garcilazo Cruz, Rigel Sebastián Gónzalez Contreras and Diana Elena Alvarez Martínez. Graduate Students: Biol. Francisco Javier Salgueiro Sepulveda (Master's degree) and Miguel Angel Hernandez Patricio (Doctoral degree starting 2013). Biol. Sara Isabel Soriano Morales. Bachelor's Thesis: Diversidad y distribución de las arañas de ¨La Cueva de los Riscos¨, Jalpan, Querétaro (Arachnida: Araneae). Facultad de Ciencias, UNAM (2009). Universidad Nacional Autónoma de México, Facultad de Ciencias: (2009 - prersent). - Biología de Anilames I, Clave 1401. - Coordinador de el Taller: Bioespeleología: fauna de cavernas, Clave 1603. - Biología General, Clave 1115. - Métodos de Reconstrucción Filogenética, Posgrado en Ciencias Biológicas Facultad de Ciencias UNAM (2012- present). - BISC 14 Introductory Biology: Cells and Molecules. Teaching assistant in the lab section. Undergraduate course. Semester Spring 2006. - BISC 13 Introductory Biology: The Biology of Organisms. Teaching assistant in the lab section. Undergraduate course. Semester Fall 2006. - BISC210 Phylogenetic Systematics. Teaching assistant in the lab section. Graduate course. Spring and Fall semesters 2005-2006. - Work Shop: Phylogenetic Analysis using Direct Optimization Analysis and running POY in computer clusters. First part: Introduction to install and use POY in the GWU computer cluster. Spring 2005. - CAS, Department of Entomology, Schlinger Foundation Postdoctoral Fellow (2007 - 2009). - GWU, Ph. D. student (2000-2007) and Teaching Assistant (2005-2006). - Collaborator in the production of the electronic catalogs of the families Tetragnathidae (TetraGen) and Linyphiidae y Pimoidae (LinyGen) (2003-2007). - Collaborator in the formation of the Colección Nacional de Arácnidos del IBUNAM (1996-1999). Australia: A four week expedition to several national parks in Queensland to collect orbicularian spiders, with Gustavo Hormiga, Nikolaj Scharff, Matjaz Kuntner and Sidsel Larsen. (2002). Chile: A four week expedition to several national parks in the central part of Chile, to collect orbicularian spiders, with Gustavo Hormiga, Jonathan Coddington and Jeremy Miller. (2000-2001). Costa Rica: Tropical Biology: An Ecological Approach. Course based in Costa Rica involving eight weeks of intensive training in tropical field work, ecology and natural history. Organization for Tropical Studies (OTS) (2002). Dominican Republic: A four week expedition to several national parks in Dominican Republic to collect orbicularian spiders, with Gustavo Hormiga and Suresh Benjamin (2004). Madagascar: A four week expedition to several national parks with Hannah Wood, Wendy Moore and Richard Brusca (2008-2009). Thailand: A four week expedition to several national parks in Thailand to collect orbicularian spiders, with Nikolaj Scharff, Gustavo Hormiga, Jonathan Coddington, Martin Ramirez, Jesper Schmidt and Dana de Roche. Also participated in a Spider Biodiversity Inventory carried out at Doi Inthanon during this expedition (2003).